Cook pasta according to package and reserve. 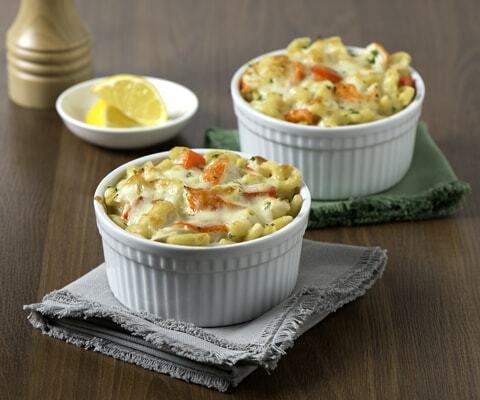 In a large bowl combine, cooked pasta, Classico® Light Asiago Romano Alfredo Pasta Sauce, 1/2 cup cheese, crab, bell pepper, basil and seasoning. Transfer into a 7x11 baking dish and top with remaining cheese. Bake for 30 minutes or until cheese is brown and edges are bubbly. If desired, substitute Classico® Light Asiago Romano Alfredo Pasta Sauce with Classico® Four Cheese Alfredo Pasta Sauce. Substitute cooked shrimp for the crab, if desired.